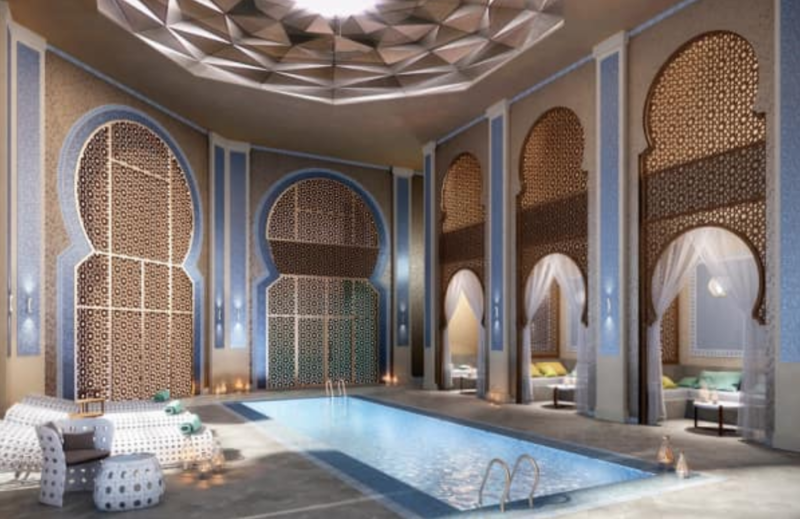 Shaza Riyadh is an oasis of luxury in the middle of the Saudi Arabian capital. Located on the crossroads of modernity and tradition, Shaza Riyadh stays true to its spirit and redefines luxury in the city. Shaza hotels are a testament to the possibility of reawakening the glorious past, heritage and traditions and fusing them successfully with the modern times of today. Shaza’s vision remains rooted in the ancient times of the Silk trade route and the caravans that travelled along it, in search of an oasis of convenience for some remainder before they continued their journey. True to that spirit, Shaza Riyadh provides guests with the epitome of luxury in a contemporary experience which is not to be forgotten soon. Striking in its use of open sunlit spaces, sophisticated patterns and rich designs, the hotel is opulent from the very first sight. The staff is friendly and indulging to the guests’ every whim. The all-day-dining eatery MeNa offers guests the decadent experience of North African and Middle Eastern cuisines, and the Bistro offers ready-to-go locally sourced and prepared food for guests on the move. Shaza Riyadh exudes luxury through its living quarters. The living quarters are elegantly rendered use muted hues and furnishings which are pleasing to the intellect and comfortable for the body. The hotel offers deluxe rooms and one- to three-bedroom suites with all-inclusive amenities such as flat-screen TVs, free Wi-Fi, kitchenettes, toiletries and vanity gadgets. The Afiya Wellness Centre takes care of the day’s ills and troubles with their therapeutic spa services, while the kids enjoy themselves at the on-site Kids’ Club nearby. There is also a fully equipped gym and heated indoor pool for fitness enthusiasts. The business centre and meeting rooms ensure guests can conduct their business in convenience. Shaza Riyadh takes care of every aspect of its guests’ needs and leaves them delighted and wanting to come back for more. Surrounded by ancient olive trees, beautiful gardens and palm trees that speak of the hospitable Arabian heritage, the Ritz-Carlton Riyadh is a majestic place. Entering the foyer, one is overtaken by the regal decoration and spacious surroundings. With 492 rooms and suites fit to house a monarch, the Ritz-Carlton Riyadh offers luxurious living fit for a five-star hotel. The rooms are elegantly decorated with plush furnishings and indulgent amenities. The hotel also offers incomparable accommodation by way of the Royal Suite, which houses two bedrooms, a dining table with a capability of 14 guests and a personal office to take care of business. Talk about luxury! The dining alternatives on offer are a mix of Italian, Chinese and Middle Eastern cuisines. The eateries on-site include all-day dining, international and local cuisine, a cigar sofa, a bowling alley and mouth-watering Arabian desserts. The hotel also offers unique chef-led dining experiences and private dining. The spa is a sprawling luxurious facility which offers relaxing therapies to tired muscles after a long day of work or leisure. However, it merely caters to males. There are separate fitness centres for males and females and each is fully equipped with state-of-the-art machinery and tools for the fitness enthusiasts. With 52 acres of lavish gardens and 62,000 sq. ft. of event space, the Ritz-Carlton lives up to its stellar reputation as a five-star luxury hotel in the middle of the Saudi Arabian capital. Located at Kingdom Centre, the Four Seasons Riyadh is a haven for business travellers and fans of city life. While other hotels may be situated a bit far from the city, the Four Seasons is strategically placed in the middle of all the happenings around the vibrant city of Riyadh. The deluxe, premium and superior rooms offer unparalleled views of the city together with muted hues and pacifying decor. The five categories of suites offer every luxurious consolation available to ensure guests have a memorable stay at the hotel. The indulgent 2-floor suite is also available to pamper guests to the fullest. Spread out over 22 floors, the living quarters are spacious, comfy and luxurious. The Four Seasons also offers a unique luxury for the dames: the Pearl Floor, which is dedicated altogether to women and offers exclusive amenities. By way of dining, the three restaurants offer mouth-watering cuisine with their own twists. The Grill is a traditional Majlis-style setting which offers local cuisine, Elements is home to international cuisine prepared from the finest ingredients, and the Lobby Lounge is a place to relax and unroll with friends over snacks and beverages. The hotel also houses a spa which offers indulgent Royal Moroccan Hamam and hot stone massage treatments for the guests. Other amenities enjoyed by guests at the Four Seasons include an outdoor pool, outdoor sports tribunals, health club with steam room and sauna, business centre, kids’ activities and a number of spacious ballrooms for events and meetings. A part of the Small Luxury Hotels of the World, the Al Mashreq Boutique hotel stands proudly near the Kingdom Centre in the midst of the city. The hotel, as the name suggests, is small but indulgent luxury is one of their main offerings. The living quarters offer views of the city or the lush interior gardens and are decorated in rich Arabian topics. Some rooms offer balconies as well. The furnishings are lavish and comfortable for the guests to enjoy a restful remain. Amenities include coffee stations, minibars, flat screen TVs, Wi-Fi and vanity kits. The two eateries, Ewaan and Al Mashrabiya, offer authentic Arabic cuisines with distinct flavors. Ewaan’s speciality is Moroccan food, while Al Mashrabiya offers Lebanese cuisine for the guests’ palates. The Tea Lounge is a great place to unroll with some sandwiches and light beverages. The spa panders guests in traditional experiences such as the Moroccan Hamam to rejuvenate their spirits. There are also massage treatments for the guests. The gym has top-notch facilities including a trainer, sauna, steam room, jacuzzi and indoor pool. The business centre, meeting rooms and ballroom offer plenty of space to conduct business and host events. Al Mashreq Boutique Hotel is the first time of its kind in Saudi Arabia, personalized service and exuding charm and luxury in everything they do. A combined business and leisure retreat, the Hyatt Regency Riyadh Olaya offers modern architecture with a mix of traditional hospitality to build the retreat worthwhile. Spread over 28 floors, the living quarters offer beautiful views of the vibrant city of Riyadh. Offering a wide variety of rooms and suites with differing views and amenities, each of the accommodations ensures a comfy stay for the guests. The in-room amenities include flat-screen TVs, media hubs with phone docking stations, vanity contraptions, tea/ coffee stations and touch panel controls for temperature and lighting. The on-site eateries offer two distinctly unique flavours from around the world. Guests can visit The Azure for Agean luxury dining or the 56 th Avenue Diner for enjoying popular dished from around the USA in a more relaxed put. With over 1000 metres of meeting spaces, events are popular at Hyatt Regency Riyadh Olaya. There are many natural attractions nearby, such as the National Museum of Saudi Arabia, Masmak Fort, and the Riyadh Zoo. Situated in prime proximity to all kinds of entertainment for all ages, Hyatt Regency is a great choice for experiencing Arabian luxury both inside the hotel and out. Have you ever experienced the indulgence at one of these hotels? Let us know!